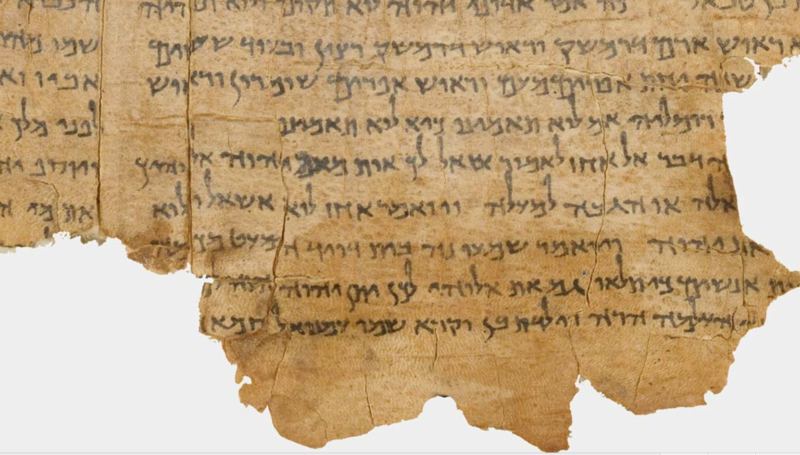 There are many similarities between the Qumran scrolls and the NT. I detail just a few below. Firstly though, what are the Qumran manuscripts (also known as the ‘Dead Sea Scrolls’ – DSS) which date from around 250 BCE up to possibly as late as 50 CE and were discovered between 1947 and 1956? When speaking of the DSS we are not just talking about the Qumran caves (probably Essenes) but most critically also the Wadi Murabba’at; the Nabal Hever and the Nabal Se’elim finds. Also critical are the finds from the Wadi ed-Daliyeh, north of Jericho (1962) and from Masada (63-64). The DSS have given scholars an enormous amount of information about the early transmission of biblical books; about the fixation of the Text (canon) and about the procedures for how the canon of the Tanakh came into being. Prior to these finds there had been little detailed information about how the Rabbinical Recession (Masoretic Text – MT) as used in Jerome’s day had come into being. What has emerged is that there are really three distinct major groups of texts. Using Cross’s naming these are the ‘Palestinian’ group (mostly from the Essenes/Qumran), the Egyptian group (LXX, Greek versions of Samuel; Kings, a short Hebrew version of Jeremiah, etc) and the ‘Babylonian’ group. It is the Babylonian group that appears to have been the work of Hillel and his son and disciples. This text group canonized the Tanakh some time between the 2 revolts of 70 and 135 CE and it is from this group that the Rabbinic Recession has derived. This group is very conservative, ‘pristine’ and shows little scribal editing, revision or modernizing. Most of the documents come from the southern caves and at Masada. This is where the authorative Pharisaic text (the proto-Masoretic text type) came from; the text that Yeshua would have used as he was in all likelihood a Pharisee or very sympathetic to their Biblical understanding (again, see Flusser for extensive evidence of this). The Essenes (Qumran) with their clear Hellenistic influences (discussed in my book referenced below) have provided a lot of helpful texts and information, and the variants such as the Isaiah variants, are generally attributable to their work. When all these finds are put together they provide great evidence for the authority of the MT of the Tanakh. “Of the 930 assorted documents from Qumran, 790, or about 85% of them are written in Hebrew (120 or about 13% are written in Aramaic, and 20 or about 2% are written in Greek). Of these 930, about 230 are biblical manuscripts, naturally are in Hebrew, so in actuality the percentage of Hebrew texts is 80%. On the other hand, our Hebrew texts are the longest ones, such as the Temple Scroll, the Community Rule, the War Scroll, and the Hodayot—with only the Genesis Apocryphon as a lengthy Aramaic scroll. The best represented of the biblical books among the Qumran manuscripts are Psalms, Deuteronomy, and Isaiah (with 34, 27, and 24 copies, respectively).Intriguingly these are also the most cited books from the Tanakh in the New Testament as well. The Qumran sectarians viewed the Temple Scroll as a book of revealed scripture, which means that they saw revelation continuing in their day; the same holds in the New Testament, where revelation is seen as an ongoing process. In Matthew 3 we read of Yochanan the Immerser (John the Baptist), speaking very critically towards some Pharisees and Sadducees that came to get a mikvah (a ritual immersion or baptism). His strict attitude and approach is very reminiscent of the Qumran Yachad’s (communities) writings. While the vast majority of the DSS scrolls come from a period a century earlier than Yochanan the Immerser, Pliny wrote that the Essene community (assuming the Qumran Yachad were the Essenes) was still resident in the area (if not Qumran specifically) well into the 1st century C.E. So again we see some NT links with Qumran. “In 2007, a new inscription—not on parchment and not in a cave, but rather on a slab of stone—was made public. It is called the Vision of Gabriel, though the term Dead Sea Stone also has been used, and it dates to the 1st century B.C.E. While the details of its discovery are not known, apparently it was discovered around the year 2000, found its way to a Jordanian antiquities dealer, and was sold to a private collector. The collector was unaware of the significance of the object until a visitor to his collection read the inscribed words, at least as best as possible. The text is ink on stone, a rare medium, since usually one incises letters into the stone. The ink is very faded, so it is hard to read the entire inscription. The stone stands about one meter high, and the inscription comprises 87 lines in Hebrew. The best paleographer of Hebrew in the world, Ada Yardeni, has authenticated the inscription. The text is known as the Vision of Gabriel because the angel Gabriel conveys an apocalyptic vision, or perhaps better a series of visions. The sense we get from the text is that an enemy nearly destroyed the “sons of the holy,” but now their leader, the “prince of princes,” will arise and overcome the adversary. Much of this, of course, sounds like phraseology known from the New Testament. This information about the ‘Vision of Gabriel’ again illustrates the commonality in understanding between the Qumran Yachad who primarily used Hebrew in their writings, and the NT authors. While again only circumstantial, it is still strong evidence that the Hebraic Jewish authors of the NT would have also predominately preferred Hebrew in their writings. “… The common theme here appears to be the end of days (Hebrew ’aharit ha-yamim), since we get references to the Temple that is to be built in the end of days, the end of the dominion of Belial, a figure known as the Shoot of David, and so forth. So again we see great parallel’s in their Biblical understanding which would surely extend to a common appreciation of the primacy of the Hebrew tongue. Christianity in the development of its Hellenistic perspective, has followed its own course, but its indebtedness to Judaism of the first century CE (or proto-Judaism as Flusser preferred), specifically of the Qumran type, is being acknowledged more and more as the DSS are studied and reported on. We can also see this indebtedness and commonality in the Apostle Paul’s approach to the use of the Minor Prophets like Habakkuk. For the writer of the Qumran ‘Pesher Habakkuk’, this prophecy of Habakkuk speaks to his present day: “And God told Habakkuk to write down that which would happen to the final generation, but He did not make known to him when time would come to an end” – 1QpHab 7:1–3. The Qumran author clearly saw an eschatological (end-times) message in Habukkuk, yet such a prophetic message is not at all clear in the original context. Hab 2:2 continues with the phrase “ … that he who reads it may read speedily,” which for the Qumran ‘Pesher’ author “… concerns the Teacher of Righteousness, to whom God made known all the mysteries of the words of His servants the Prophets” – 1QpHab 7:4–5. And then Habukkuk 2:4 states, “But the righteous shall live by his faith,”. We would normally conclude, as I have certainly argued before, that the righteous person shall prosper by his own faith or trust in God. But this same passage of Habakkuk is quoted three times in the New Testament in Romans 1:17, Galatians 3:11, and Hebrews 10:37–38 (possibly also authored by the Apostle Paul). The Apostle Paul, just like the Qumran author before him, sees this passage as referring to the Age to Come (the Olam Ha Bah or the Kingdom of God), and in the Apostle Paul’s case to Yeshua as well. Without going into the numerous examples, this interpretative method of applying certain passages from the Tanakh to present realities, as per Pesher Habukkuk, is also quite common in the NT from Matthew to the Apostle Paul’s epistles, and to my understanding further supports the common and shared Hebraic mindset that would have included the use of the Hebrew language. This entry was posted in Articles and tagged DSS, Hebrew, Qumran, qumran scrolls, yeshua. New Testament. Bookmark the permalink.